They surf, hike, rock climb and, starting this month, travel around the country inside an 82-square-foot van. 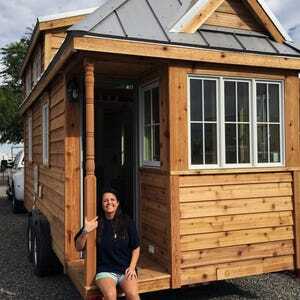 They surf, hike, rock climb and, starting this month, seek out hotel lobbies with free WiFi to blog about their travel adventures across the country in their self-built tiny home­ — an 82-square-foot sprinter van. In their travel blog, “The Bro’d Trip,” the UCF graduates describe themselves as “two brothers fighting the pull of the post-college desk job.” Embarking on an ambitious yearlong road trip across all 50 states, their last stop will be Hawaii, which they — perhaps wisely — decided to travel to via plane with their parents. Both in possession of a bachelor’s degree in interpersonal communication, Justin and Adam Fricke had the option of finding comfortable corporate jobs with multiple benefits. But the vision of such a future does not tempt them in the least, especially considering Justin actually left such a job with Mercantile Bank to make his road trip dream a reality. Neither brother had any experience building things, but with the help of Google, YouTube and their parents’ garage, they taught themselves and managed to retrofit the van within a month. The project cost about $1,000 worth of construction materials, not including the cost of the van, coupled with 30 hours of physical labor per week. To cut expenses, they installed solar panels, tried to find free places to park overnight and secured corporate sponsors, such as Merrell and Enerplex, to partially fund them. “This didn’t just happen overnight. We saved up two years for this,” Justin Fricke said. After two years of saving for expected trip expenses, they launched their trip from Orlando on Jan. 1 and have made their way to Savannah, Georgia, with plans to head into Charleston, South Carolina, soon. The end goal is to travel through the East Coast and gradually make their way to the West Coast. To stay within the budget, they still rock the typical college cuisine with exquisite delicacies such as Ramen noodles with canned chicken. Fine dining aside, the Fricke brothers said they are excited about their upcoming adventures — as are their parents, the source of the brothers’ love of surfing and insatiable thirst for travel. When asked what they hope to gain from the whole experience, they emphasized the word “fun.” They also remarked upon the potential to build careers from their recently acquired expertise in blogging, photography and videography. Besides the occasional “dynamic discussion,” as the duo likes to call arguments, things are going well for the traveling pair so far. They are optimistic about their hybrid vacation and professional development trip and offer the following advice to anyone inspired by their story.